The Mitch attack is good against most bases, but I really like using it against diamond bases these days. The vast majority of diamond base designs will have their key defenses at one end or the other of the base. 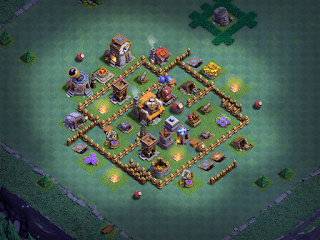 In the case of those with the bottom in the lower left corner of the game grid, they often put either the MultiMortar or the AirBombs at one end or t'other. Any base with the MultiMortar exposed like that is a solid candidate for a Night Witch based attack. The deployment strategy is either from a corner or from one of the sides of the base. I usually deploy from the corner as this gives the Battle Machine time to walk off his first charge and the Night Witches time to dispatch a few salvos of Bats to clear out mines set to air. My corner of choice is the one that gets me to the MultiMortar or AirBombs the fastest. If the base design warrants it, I'll also dispatch from the side (typically against a box base with key defenses on one side rather than near a corner). Beta Minions will typically come in behind the Night Witches, but that's not always a requirement; in fact, I like to start off by picking off structures outside the range of defenses and I'll often bring the horde in from a completely different side or approach vector. This is in response to the base design; sometimes, the base is good for different troops on different sides. As always, I recommend taking 30 or so seconds to really evaluate the layout of the base before you deploy. Try to suss out where the MegaMines might lie, where the Hidden Teslas are hiding, how your troops might path, and what key defenses are where. This will go a long way in getting you a higher percentage win. Recently, a LOT of players started putting a MegaMine in the uppermost corner of the game grid as a deterrent to Night Witch attacks. It's become common enough that you need to test for this defense every time you use Mitch, GiWitch, or otherwise deploy troops in the corner. In the past, this was an option; that corner mine has become a regular feature for a lot of base designers. Players that are new to BH7 will find this attack especially appealing. It's solid with level 12 troops - even if your Battle Machine is still level 5. In the 3000s trophy level, Mitch with the added fifth Army Camp will wreak heavy destruction on BH6 games as well as early BH7 games. Having higher level Beta Minions and/or Night Witches does not become a requirement until much further up in the trophy rankings when you start coming up against max or near-max BH7s. BH6 players take heart - Mitch is still a good attack for you, even against BH7 bases. My flagship game (Noctaire) was taken down for a 79% win by a BH6 player while the MultiMortar was under construction. The key to success using this as an underdog strategy is to prevent your Night Witches from getting hit by the Giant Cannon or MultiMortar. Focus on taking the MultiMortar down (like always) but keep the Night Witches from bunching up; as a tight group, they are vulnerable to "community damage" from the Giant Cannon's cannonball; spread out, he can only hit them one at a time. The best defenses against Night Witch are base designs that keep key defenses away from the edge, separate defenses in such a way as to create overlapping firing zones, and placing Cannons/Double Cannons/Giant Cannons in a way they can defend common points of ingress effectively. Additionally, placing your base somewhere other than the lowermost corner of the game grid will often slow the attacker; southern teasers in the uppermost corner can be an issue for this attack strategy. For video replays, hope over to my YouTube channel (link below). I have a couple of replays against BH6 bases, and a mix of replays against BH7 with/without the Giant Cannon. Replays are taken from 3 of my BH7 games - Noctaire (primary, mostly level 6 defenses, all level 12 offense, level 10 Battle Machine, 4100 trophies), Nachtherr (secondary, mix of level 5/6 defenses, level 12 offense, level 5 Battle Machine, 3900+ trophies), and KussVonNacht (secondary, mix of level 5/6 defenses, level 12 offense, level 5 Battle Machine, 3500+ trophies). If you're new to the channel, please help build it up by liking the video and hitting the subscribe button. Thanks!